The aim of the present work was to demonstrate the relative densities of T lymphocytes, CD4+ cells, CD8+ cells, and B lymphocytes in a series of breast carcinoma. Furthermore, the relationship between the density of each cell immunophenotype and the clinicopathologic factors of prognostic significance was assessed. This retrospective study included 48 breast carcinoma archival tissue specimens obtained from female patients who underwent excision biopsy or mastectomy at Ain Shams University Hospitals, Cairo, Egypt, during the period from January 2010 to June 2011. The criteria for selection of the specimens were: No history of preoperative chemotherapy, radiotherapy, or endocrine therapy, and cases diagnosed as invasive duct carcinoma, not otherwise specified (NOS). Representative paraffin blocks and hematoxylin and eosin (HandE)-stained sections were retrieved from the pathology departments at Ain Shams University Hospitals. The patients' files were reviewed to record the patient age and the clinical stage of the disease. The latter was reported according to the American Joint Committee of Cancer. The patients were grouped into two age groups (≤40 years and >40 years). In addition to the breast carcinoma specimens, 30 tissue samples from age-matched benign proliferative breast lesions were collected to compare the pattern of TILs in malignant and benign breast lesions. All patient data were collected and tissue specimens were retrieved in an anonymous way; so no consent was needed from the patients. The research study was approved by the Research Ethical Committee of Ain Shams University, the rules of which were in accordance with the ethical standards laid down in the 1964 Declaration of Helsinki. Representative HandE-stained tissue sections from all 48 breast carcinomas were examined for histologic grading of tumors according to Bloom and Richardson,  which classified invasive duct carcinoma (NOS) into grade 1 (well differentiated), grade 2 (moderately differentiated), and grade 3 (poorly differentiated). Histologic sections of both carcinoma cases and benign breast lesions were examined for the density of TILs which were semi-quantitatively graded as mentioned subsequently. Formalin-fixed, paraffin-embedded tissue sections from the 48 mammary carcinomas and 30 benign breast lesions were immunostained for CD3+ (T-lymphocyte marker), CD4+ (helper/inducer T-lymphocyte marker), CD8+ (suppressor/cytotoxic T-lymphocyte marker), and CD20+ (B-lymphocyte marker). All antibodies were mouse monoclonal antibodies and available ready to use (Dako, Glostrup, Denmark). The immunohistochemical technique was performed by applying the supersensitive avidin-biotin detection kit (Biogenex, Fresno, CA, USA) and following the technique of Hsu and Raine. Microwave antigen retrieval in citrate buffer (pH 6.0) was performed. In parallel, positive controls (using normal human tonsil) and negative controls (by omitting the primary antibody) were performed to ensure the correct staining procedure. TILs were evaluated in H and E-stained and immunostained tissue sections for both mammary carcinomas and benign breast lesions by two pathologists who were unaware of the clinical data. Areas of highest lymphoid density were selected and necrotic areas were avoided. The density of the total lymphocytic infiltrate in H and E-stained sections and the density of each cell immunophenotype in the immunostained slides was semi-quantitatively graded according to Kreike et al. into: Absent, minimal (less than 10 lymphocytes/high-power field 40×), moderate (lymphocytes easily identified but no large aggregates), and extensive (large aggregates of lymphocytes in more than 50% of the tumor). For statistical purposes, minimal and moderate grades were grouped as intermediate. Data were analyzed with SPSS for Windows. The frequencies of the various types of TILs in breast carcinomas and benign lesions were compared by means of Fisher's exact test. The relationships between the density of the immunophenotyped cells and the prognostic variables were determined by applying Chi-square test. Correlations between the density of the total TILs and each of the lymphocyte subsets were determined by Pearson's correlation coefficient. The level of significance was set at <0.05. The patients with mammary carcinomas were aged between 30 and 75 years (mean = 49.4 ± 12.9). The clinical stages of the disease were stage II in 30 cases, stage III in 12 cases, and stage IV in 6 cases. Histologically, all tumors were invasive ductal carcinomas (NOS). The histologic grades were grade 2 in 12 tumors and grade 3 in 36 tumors. Examination of HandE-stained sections revealed that Tumor-infiltrating lymphocytes (TILs) were evident in 39 of the 48 carcinomas (81.3%). The infiltrating lymphocytes were predominantly noted in the stroma surrounding and separating the tumor masses or at tumor edge. Semi-quantitative scoring of the density of TIL showed that it was absent in 9 tumors, intermediate in 33, and extensive in 6 tumors. Immunophenotyping demonstrated that the majority of TILs were T lymphocytes which were present in all 39 carcinomas with TIL (81.3% of all carcinomas) [Figure 1]a. On the contrary, B lymphocytes were noted in 24 of the 39 tumors with TIL (50% of all carcinomas) [Figure 1]b. Co-expression of T and B lymphocytes was evident in 33 tumors (68.8%). T and B lymphocytes were usually seen in close proximity [Figure 1]. CD4+ cells were a constant component of T lymphocytes in all 39 tumors [Figure 1]c, while CD8+ cells were noted in 27 of the 39 tumors [Figure 1]d. Thus, the ratio of tumors revealed CD4+ to those with CD8+ cells was 1.34. The frequency of total TILs, T lymphocytes, CD4+ cells, CD8+ cells, and B lymphocytes was significantly higher in breast carcinomas than benign breast lesions [Table 1]. On the other hand, the density of TILs, T lymphocytes, CD4+ and CD8+ cells showed a significant direct association with patient age (P = 0.003, P = 0.004, P = 0.001, and P = 0.01, respectively) [Table 2]. When TILs were analyzed according to the clinical stage of breast cancer, stages III and IV tumors showed significantly higher densities of total lymphocytes, T lymphocytes, and CD4+ lymphocytes than stage II tumors (P = 0.003, P = 0.004, and P = 0.009, respectively) [Table 3]. Similarly, poorly differentiated carcinomas (grade 3) had significantly higher density of TILs, T lymphocytes, and CD4+ cells than better differentiated tumors (grade 2) (P = 0.003, P = 0.004, and P = 0.001, respectively) [Table 4]. On the contrary, B lymphocytes showed no significant association with any of the above-mentioned parameters. 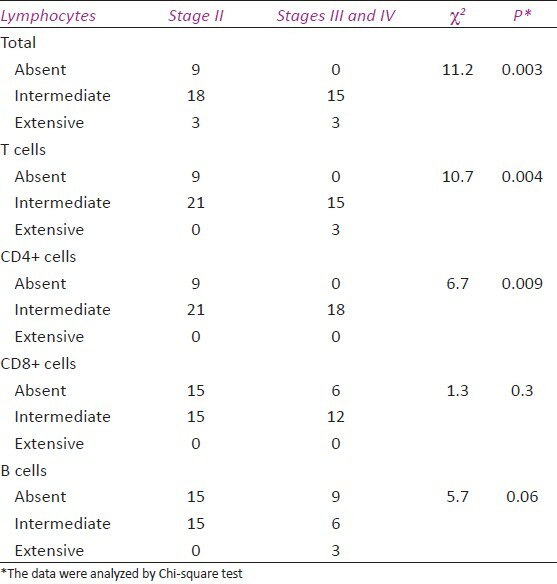 Correlation between the lymphocyte immunophenotypes and the total TILs revealed a highly significant positive correlation between each lymphocyte population/subpopulation and the total TILs [Table 5]. TILs were demonstrated in 81% of our breast carcinomas. This percentage approximates that reported by An et al.,  but is higher than that reported by Marsigliante et al. This is possibly due to inclusion of larger numbers of poorly differentiated carcinomas in our study than in the series of Marsigliante et al. As we shall see subsequently, poorly differentiated carcinomas have a significantly higher frequency of TILs. One of the most controversial issues with respect to the immunophenotyping and TILs in breast cancer concerns the relative abundance of T-lymphocyte subpopulations. In the present study, CD4+ cells were more prevalent than CD8+ cells. Although these data agree with some authors' reports, ,,, the reverse was reported by others. ,, The most possible causes for these contradictory results are variations in patients' or tumor selection, the use of different techniques (flow cytometry vs. immunohistochemistry), and the use of different methods in interpretation of immunophenotyping (quantitative vs. semi-quantitative). Analysis of the relationship between the density of TILs and patient age demonstrated that T lymphocytes and their subsets CD4+ and CD8+ cells were directly associated with patient age. Such a relationship has been investigated in a few studies with discordant results. Marsigliante et al. found that only T cells were directly associated with the patient age, thus supporting, in part, our results. Conversely, Menard et al. reported no significant difference among different age groups with respect to the frequency of TILs. More recently, Mahmoud et al. showed that the number of CD8+ lymphocytes was weakly inversely correlated with the age of breast cancer patients. When TILs were investigated according to the clinical stage of disease, stages III and IV had a significantly higher density of T lymphocytes and CD4+ cells than stage I. The association between T lymphocytes with advanced disease may be due to the ability of these cells to produce vascular endothelial growth factor and fibroblast growth factor which stimulate lymphangiogenesis and angiogenesis, and consequently promote dissemination of cancer cells. It is worth mentioning that our finding does not support an earlier study  which revealed that the intensity of T lymphocytes was significantly lower in stage III than in stage I and II breast carcinomas. The authors claimed that T-cell infiltration did not represent tumor-induced immunosuppression, but an inherent weak host immune surveillance which contributed to tumor progression. As previously described, ,, T lymphocytes and T-cell subpopulations were significantly associated with higher histologic grades. This result suggests that the degree of tumor differentiation may influence the degree of immune response of the patient. The present study suggested that although T and B lymphocytes were expressed in breast carcinoma, T lymphocytes and their subsets (especially CD4+ cells) predominated quantitatively and qualitatively. They seem to promote neoplastic progression rather than acting as a protective immune response against cancer. However, a study with a larger number of cases is recommended. 1. An T, Sood U, Pietruk T, Cummings G, Hashimoto K, Crissman JD. In situ quantitation of inflammatory mononuclear cells in ductal infiltrating breast carcinoma. Am J Pathol 1987;128:52-60. 2. Menard S, Tomasic G, Casalini P, Balsari A, Pilotti S, Cascinelli N, et al. Lymphoid infiltration as a prognostic variable for early -onset breast carcinoma. Clin Cancer Res 1997;3:817-9. 3. Marsigliante S, Biscozzo L, Marra A, Nicolardi G, Leo G, Lobreglio GB, et al. 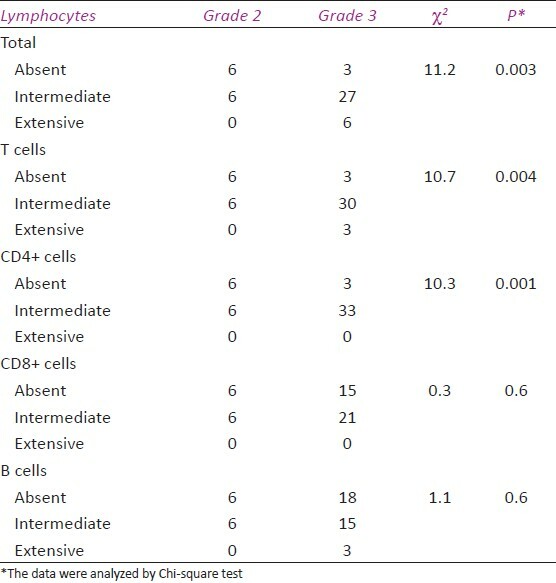 Computerized counting of tumour infiltrating lymphocytes in 90 breast cancer specimens. Cancer Lett 1999;139:33-41. 4. Coronella JA, Spier C, Welch M, Trevor KT, Stopeck AT, Villar H, et al. Antigen-driven oligoclonal expansion of tumor-infiltrating B cells in infiltrating ductal carcinoma of the breast. J Immunol 2002;169:1829-36. 5. Mooe OS, Foote FW Jr. The relatively favorable prognosis of medullary carcinoma of the breast. Cancer 1949;2:635-42. 6. Black MM, Barclay TH, Hankey BF. Prognosis in breast cancer utilizing histologic characteristics of the primary tumor. Cancer 1975;36:2048-55. 7. Hamin IM. Possible host resistance in carcinoma of the breast. Br J Cancer 1986;22:382-401. 8. Macchetti AH, Marana HR, Silva JS, Andrade JM, Ribeiro-Silva A, Bighetti S. Tumor-infiltrating CD4+ lymphocytes in early breast cancer reflect lymph node involvement. Clinics 2006;61(Suppl 3):203-8. 9. Matkowski R, Gesterek I, Halon A, Lacko A, Szewczyk K, Staszek U, et al. The prognostic role of tumor-infiltrating CD4 and CD8 T lymphocytes in breast cancer. Anticancer Res 2009;29(Suppl 7):2445-51. 10. Chin Y, Janseens J, Vandepitte J, Vandenbrande J, Opdebeek L, Raus J. Phenotypic analysis of tumor-infiltrating lymphocytes from human breast cancer. Anticancer Res 1992;12(Suppl 5):1463-6. 11. Ben-Hur H, Cohen O, Schneider D. The role of lymphocytes and macrophages in human breast tumorigenesis: An immunohistochemical and morphometric study. Anticancer Res 2002;22:1231-8. 12. Balc CM, Riley LB, Bae YJ, Salmeron MA, Paltsoucas CD, Von Eschenbach A, et al. Patterns of human tumor-infiltrating lymphocytes in 120 human cancers. Arch Surg 1990;125:200-5. 13. Wang B, Springer GF, Kaufman MW. Concurrent immunohistochemical staining of tumor-infiltrating lymphocytes and carcinoma-associated T (Thomson-Friedenreich)/Tn antigens in human breast carcinoma. J Histochem Cytochem 1996;44:187-91. 14. Naukkarinen A, Syrjanen KJ. 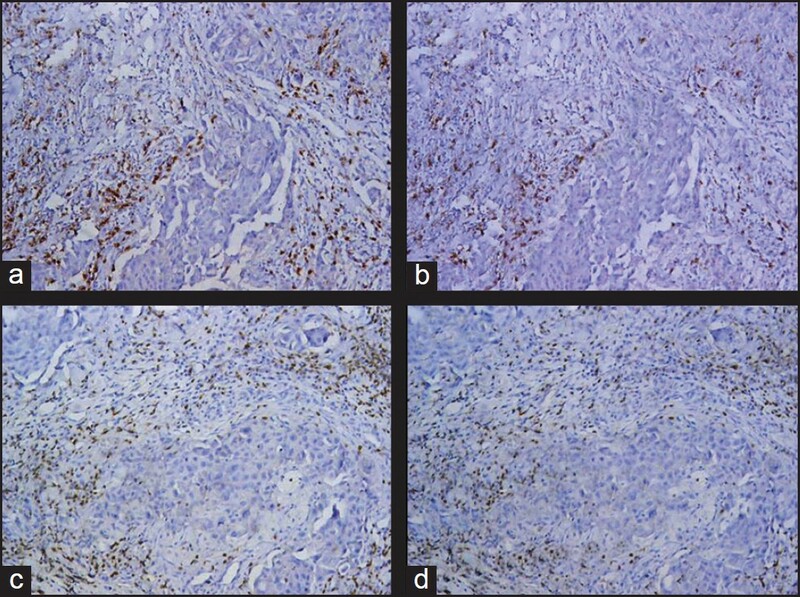 Quantitative immunohistochemical analysis of mononuclear infiltrates in breast carcinomas-correlation with tumour differentiation. J Pathol 1990;160:217-22. 15. Sheu BC, Kuo WH, Chen RJ, Huang SC, Chang KJ, Chow SN. Clinical significance of tumor-infiltrating lymphocytes in neoplastic progression and lymph node metastasis of human breast cancer. Breast 2008;17(Suppl 6):604-10. 16. Edge B, Brgrd DR, Coducci MA, Compton CC, editors. AJCC cancer staging manual. 7 th ed. New York, NY: Springer;2009. 17. Bloom HJ, Richardson WW. Histological grading and prognosis in breast carcinoma. Br J Cancer 1957;11:359-77. 18. Hsu S, Raine L. Protein, avidin and biotin in immunohistochemistry. J Histochem Cytochem 1981;29:1349-53. 19. Kreike B, Van Kouwenhove M, Horlings H, Weigelt B, Peterse H, Bortlnk H, et al. Gene expression profiling and histopathological characterization of triple-negative/basal like breast carcinoma. Breast Cancer Res 2007;9:R65. 20. Colotta F, Allavena P, Sica A, Garlanda C, Mantovani A. Cancer-related inflammation, the seventh hallmark of cancer: Links to genetic instability. Carcinogenesis 2009;30:1073-81. 21. Schmidt M, Böhm D, von Törne C, Steiner E, Puhl A, Pilch H, et al. The humoral immune system has a key prognostic impact in node-negative breast cancer. Cancer Res 2008;68:5405-13. 22. Tesniere A, Apetoh L, Ghiringhelli F, Joza N, Panaretakis T, Kepp O, et al. Immunogenic cancer cell death: A key-lock paradigm. Curr Opin Immunol 2008;20:504-11. 23. Zitvogel L, Kroemer G. Introduction. The immune response against dying cells. Curr Opin Immunol 2008;20:501-3. 24. Clark CE, Hingorani SR, Mick R, Combs C, Tuveson DA, Vonderheide RH. Dynamics of the immune reaction to pancreatic cancer from inception to invasion. Cancer Res 2007;67:9518-27. 25. Hussein MR, Hassan HI. Analysis of the mononuclear inflammatory cell infiltrate in the normal breast, benign proliferative breast disease, in situ and infiltrating ductal breast carcinomas: Preliminary observations. J Clin Pathol 2006;59:972-7. 26. McDermott RS, Beuvon F, Pauly M, Pallud C, Vincent-Salomon A, Mosseri V, et al. Tumor antigen-presenting capacity in breast cancer. Pathobiology 2002;70:324-32. 27. Jager E, Jager D, Knuth A. Strategies for the development of vaccines to treat breast cancer. Recent Results Cancer Res 1998;152:94-102. 28. Camp BJ, Dyhrman ST, Memoli VA, Mott LA, Barth RJ Jr. In situ cytokine production by breast cancer tumor-infiltrating lymphocytes. Ann Surg Oncol 1996;3:176-84. 29. Nzula S, Going JJ, Stott DI. Antigen-driven clonal proliferation, somatic hypermutation, and selection of B lymphocytes infiltrating human ductal breast carcinomas. Cancer Res 2003;63:3275-80. 30. Simsa P, Teillaud LL, Stott DI, Toth J, Kotlan B. Tumor-infiltrating B cell immunoglobulin variable region gene usage in invasive ductal brest carcinoma. Pathol Oncol Res 2005;11(Suppl 2):92-7. 31. Mahmoud S, Lee A, Ellis I, Green AR. Cd8+ T lymphocytes infiltrating reast cancer A promising new prognostic marker? Oncoimmunology 2012;1:1-2. 32. Mor F, Quintana FJ, Cohen IR. Angiogenesis-inflammation cross-talk: Vascular endothelial growth factor is secreted by activated T cells and induces Th 1 polarization. J Immunol 2004;172:4618-23. 33. Shimokawara I, Imamura M, Yamanaka N, Ishii Y, Kikuchi K. Identification of lymphocyte subpopulations in human breast cancer tissue and its significance: An immunoperoxidase study with anti-human T- and B-cell sera. Cancer 1982;49:161-72. 34. Lee AH, Happerfield LC, Bobrow LG, Millis RR. Angiogenesis and inflammation in invasive carcinoma of the breast. J Clin Pathol 1997;50:669-73. Source of Support: None, Conflict of Interest: The authors report no confl icts of interest. The authors alone are responsible for the content and writing of the paper. They did not receive any fi nancial support from any organization to fulfi ll this research.